DID THIS MOTHER FU**** GET CAUGHT OR WHAT! Looks like we have look alike garage , except My SRT is a Quad cab . Who says we cant beat him , If everyone chips in some $$$ to the cause , He will get dealt with . seems like a large influx of more money than brains as well. If you incurred a loss from this individual, please fill out a complaint at ic3.gov the FBI cyber crime reporting place. here is the link. It has a place you can put for monetary loss, reference this thread PLEASE and include names and phone numbers. Some of you may know Im looking for these particular wheels and the numnuts is till using the same pic. I knew the pic was familiar. Sorry if I dragged this up. You can see his email and name if that helps anyone (if that is his real name) his profile on MBWORLD is elbert0. And he joined here yesterday. Last edited by V8Merc124; 06-10-2014 at 08:47 PM. Very interesting. I have my C63 AMG up for sale and got a message from a guy that was looking to buy it. The messages were weird, so I decided to google the e-mail address and it came listed as one of the scam e-mail accounts. Buyers beware! Elbert0 emailed me to sell set of c55 mbh headers for $800. He said he can take moneygram only because his paypal account is dormant. When asked about his # so I can call or text and that I am interested in picking up the item in person, he went silent. So this scammng ***** is somehow related to the Bostom Marathon bombings??? We should have kicked his *** when we had the chance. 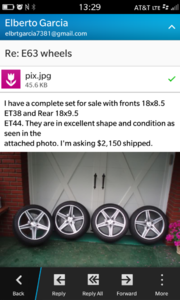 I just can't believe how this guy is stupid enough to use the same photos to try and pull the same scam holy crap.. mind blown. This guys an obvious scammer. We had an entire community track down every bit of info we needed and YET nothing happened? If you say the local authorities forwarded everything to the local DA and THAT retard didnt want to press charges maybe someone can find out the relevant contact information and we can flood his office with calls. Although at this point I suppose there is some sort of statue of limitation or something in effect? Unreal. Hats off to all the people that contributed and to those who failed to act, for shame a criminal like this was let go and is still up to the same crap and NO ONE can do anything. So, whose the turd DA refusing to prosecute? This guy is a career criminal and we should not be sitting idly be. Others who haven't seen this will get burned and he will continue to collect his Nike shoes and ride with the "heater". Hey guys, I'm trying to do an IP check and I can't find any users by the name of Elbert0. Thank you. The registration IP is Washington DC. I don't see any similar users with the same address. 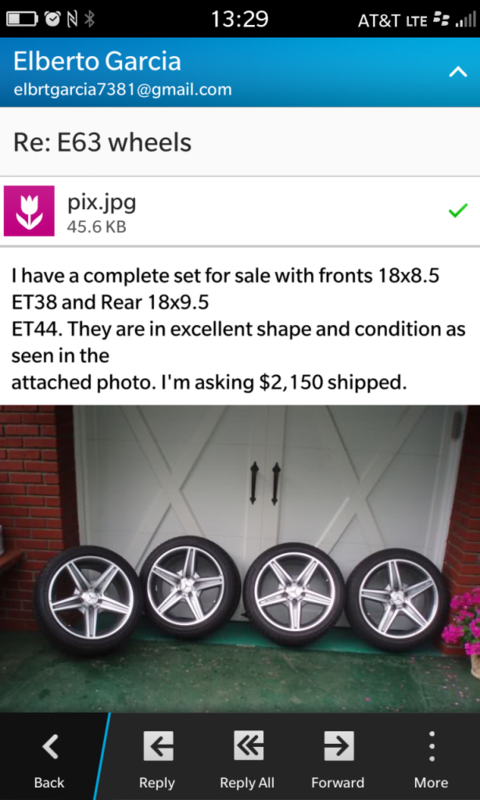 Pm if you are interested in e63 wheels and your offer! I have my oems that im still running assume no tires when I ship or picked up! Old thread, did the guy get nailed? Hope you got your money back.